When I look back on how it was to be 17 years old, I think about bicycles: I think about one bicycle in particular, and about having nothing else to do but pedal it down the country roads. I think about how the Northern Ohio landscape rolled with corn fields and concord grapes back then. I think about the novelty of balance, and about the prolonged physical joy of covering miles under my own power. Alone while the day was still cool, I’d whisper along the two lane roads with just my breath and skinny wheels disturbing the dawn silence. I’d count my pedal strokes, measure them against the sweep second hand on my watch. I’d keep my head down, and remember the position of my elbows, or the path of my knees, up and down, each knee cutting a sine wave through the air as it propelled me down the road. At least once a week: a rabbit would jump sideways and scamper into the long grass, or maybe a groundhog would twitch and be gone almost as soon as it moved, and then I’d be gone, too, ten strokes down the road, and watching for whatever came next. That’s what I was thinking about on a Saturday morning at age 48 as I drove toward a hole-in-the-back-wall bike shop on the west side of Cleveland, to look at an old French bike. It was a Saturday morning. The entrance was through the loading dock door at the back of the building. The old sign was faded and flaking, but you could still read that the place was once a laundry service. The only clue that a bicycle shop had moved in was a hand-painted sandwich board on the sidewalk, halfway around. That and some DIY promotion: an old English three-speed chained to a phone pole, rusted –chrome and all–to an even shade of brown. I was there because I had seen an ad on the internet, describing “Two high-end Peugeot frames from the ’70s.” My first serious racing bike was a silver-grey Peugeot with a Reynolds 531 steel Frame and sew-up tires. It’s the bike of my 17 year old dreams..I rode it tens of thousands of miles. One year I got a sheet of black alphabet decals and spelled out CLEVELAND on the front of each fork blade. 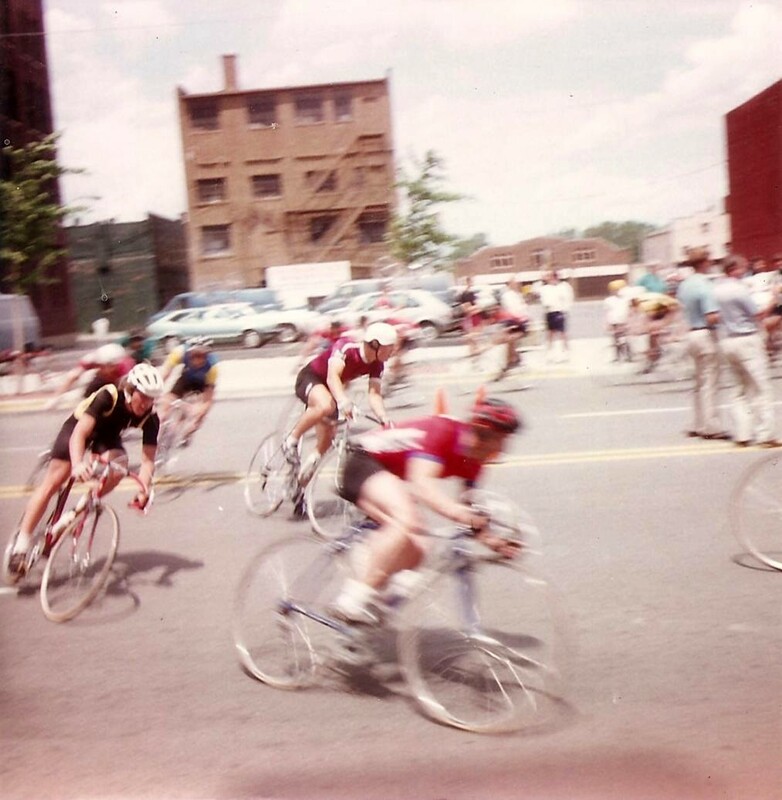 That was the team I rode with then, the Cleveland Wheelmen. A few years later I sold that bike and bought another. And I didn’t think about it again for more than two decades. But for men in their forties, the machines that moved us in our youth have a way of coming back to mind. For some of my age, it’s a Corvette or a Camaro. For me it was about an old French bike. So I walked up the little set of wooden steps at the back of the building, and into Blazing Saddle Cycles. “I’ve never heard of you guys before,” I said as I surveyed the place and took in its DIY ambiance. Used bikes. A boarded up storefront. A loading dock as front door. Because what do you say when the greasy patina of mechanical intrigue runs hard into your concern that all the stolen bicycles in the city might find their way up that same set of wooden steps? But after a minute it didn’t feel that way. “We take old bikes and put them back into use,” the owner said. I told him I was the guy who called about the Peugeots. He went back into the shop and brought out the two advertised frames, one in each hand. He stood them on the counter. They were as promised, one white, the other a silver gray, metallic, almost like hammered pewter. Both were made with Reynolds 531 tubes. According to the company that makes it, bikes made of Reynolds 531 tubing were pedaled to no fewer than 27 victories in the Tour de France. One “High End” Peugeot from the ’70s. Immediately I could see that the white frame was too big for me, so there was no sense looking at that. But looking at the other one was a different story, and it made me start to think about my bank account: perhaps I might be able to consider spending a few dollars on another bike, after all. There was no way to deny that this one happened to be the same model, size, and color as my old Peugeot. The guy behind the counter told me the bike I was looking at came to his shop from a guy who got it from his father. There were chips in the paint, and specks of rust, but no cracks or dents. I noticed some flaked-off black decals on the front of the fork blades, and in some shallow way I knew those letters meant that something remarkable was happening just then. But it didn’t sink in until I turned the frame toward me, just to make sure all the tubes remained straight and true. In the passing seconds I realized there was no question: My old French bicycle –the frame, at least–had come back to me. Those flaking decals on the front of each fork blade were the remains of what I had put there almost 30 years earlier: black Helvetica letters spelling out the name of the city that was home to my old racing team: CLEVELAND. More than a quarter of a century after I sold it, I was once again looking at the frame from my bicycle. Not just the same make, model, year, size, and color but the very same one I had pedaled all those miles. Those Cleveland decals were proof as good as a notary stamp. Since the last time I saw this bike, Ronald Reagan completed his presidency. So did George H.W. Bush, Bill Clinton, and George W. Bush. There were three wars. The United States had elected Barack Obama the first African American president. Time had gone by. My own clock ticked along, too. Since I’d sold this bike I had started and finished graduate school. I had moved away from home. I had lived in five cities, three states, and three countries and moved back to Cleveland. I had met a woman and married her. We We bought a house. We had two children. One of them had reached middle school. I had gained 20 pounds. I had reached middle age. And at he time of life when people start to have more to look back on than forward to, I had come face to face with the same racing bike I had when I was a kid. “I’ll take it,” I said, and I paid the asking price, without even attempting to bargain down. sigh- I am always hoping to find my first bike love too- a ca 1980-81 Austro-Daimler Vent Noir II stolen off my back porch one June evening in 1996. I will know it when I see it because it had been re-painted shortly before I bought it. The thief likely had attended my yard sale earlier in the day and cased the house; like an idiot I thought my enclosed porch was safe and did not lock my bike. Coming home to my empty porch I cried; it literally broke my heart. I didn’t buy another bike for 2 years and that purchase was really dumb. I hated but kept that bike for the next 12 years (punishing myself for losing my bike to a petty thief perhaps) until I finally felt that I deserved decent bike again. I am now the queen of locks and my wonderful Surly LHT makes me very happy indeed, but I really would love to meet up with my long lost A-D. This story gives me chills. So beautiful. Now, this – this is a story worth sharing. Gotta love Karma, hm? Just read your article. I worked for Heinze Linke from 1974-1976. It was all part-time. Bought my first decent bike, a Gitane Interclub in 1973 when I was a senior in high school. This was when Heinze was still operating out of his basement in Bay Village-before a competing bike shop- not his neighbors-complained to the zoning board, and he opened the shop at 13375 Madison. Then in the summer of 1975, I worked at the shop in the evenings after my regular summer job in order to pay for a Peugeot PX10E. It is hanging on my office wall. I now ride a Torelli road bike, TIGed Columbus db steel, mid-range Campi, indexed… My PX10 is hard to recognize. 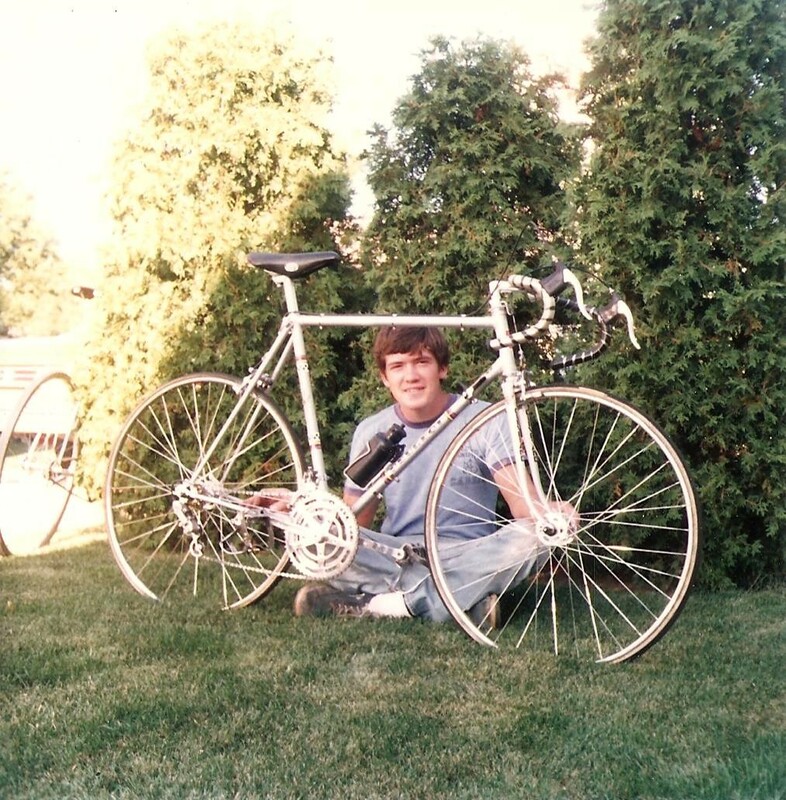 Got hit by a car in Columbus back in 1980 and took the bike apart to have it checked by Dave Barbour, a frame builder. Paid him to do some braze-on’s and re-paint it with red Imron. Put better wheels with a 6-speed cog, an updated alloy simplex rear and side-pulls on it some time in the 80’s. Re-bored the cranked for modern thread and put SPD pedals on it around 2006 because by then you could no longer buy slotted pedal cleats. The only reason I don’t ride the PX10 anymore is that the main spring on the dersaileur is worn-out and won’t hold on hills. You know how it is; all French threads, proprietary derailleur hangers, old-style frame span between the rear stays. Can’t find a way to replace the derailleur. nyone I show it to either turns-up their nose or says, “Hey man, turn it into a fixie.” Ya, and get a bunch of dumb tatoos and move to Brooklyn while I’m at it. Anyway, I hope you get your Peugeots back on the road. Wish I could. I really miss the feel of the PX10. 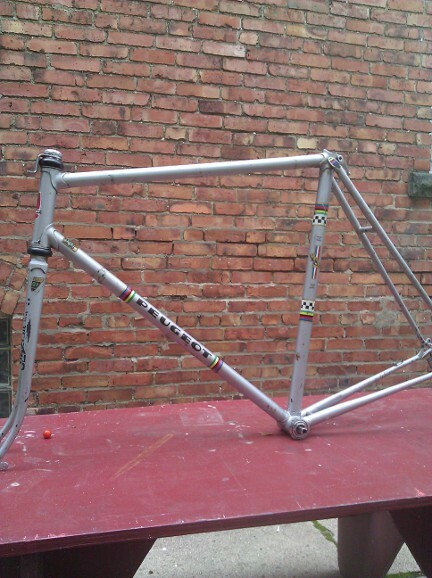 Was working with my wife a few years back and a guy went past on an original paint Raleigh Pro MK-4. It was from about 1974 and he got it real cheap. Did a few updates, newer crank-set and system pedals, but nothing that disrupted the overall look. He has a newer bike that he rides with a club, but goes out on the MK-4 on his own because it’s the bike he wanted, but couldn’t afford in college. Roger, Thank you for your thoughtful response. And what a great surprise to discover someone who not only knew, but worked with Heinze Linke. I’d love to correspond with you a bit about that, as I plan to write a bit more about this . 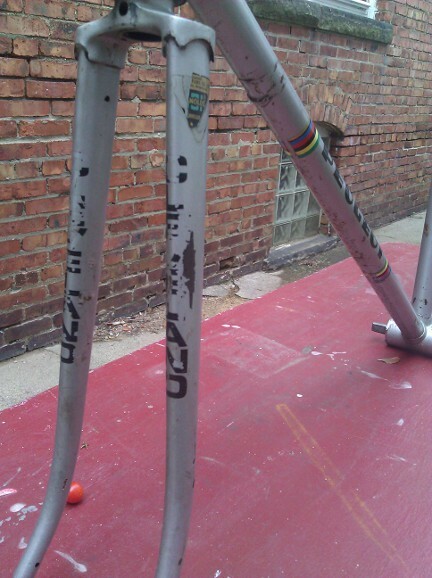 . . A kind of a cycling memoir, pegged to this reunion with my old bike. Heinze was a cycling mentor to me. I would have been about 14 years old and riding the UO8 I had before I got this bike, when I started joining him on Sunday rides. In the early season we’d meet in a parking lot on Mills Road and ride loops around Jaycox, Schwartz, and Lear-Nagle, back to Mills. Then as the weather turned and fitness imporoved, we’d meet in Columbia Station, or in a parking lot on Lorain near Barton, and ride out to Oberlin and back. I knew a few things about him, and he said a few memorable things to me, but I wouldn’t say I knew him well. We didn’t socialize. I was a teenager, and he was near retirement. I’d love to know more about him . Meanwhile . . . I clicked the link to your website, and saw that you are a sculptor / installation artist. As it happens, I publish a magazine about art in Northeast Ohio . . . CAN Journal. You can find a slowly improving online version of it at canjournal.org, but I’d love to send you the printed form. It’s kind of a remarkable thing, if I do say so myself.